At Bucks County Free Library, we are proud to work alongside several Friends groups – at our Doylestown, Levittown, Perkasie, Quakertown, and Yardley-Makefield branches – to help expand the library’s resources and enhance our ability to serve the public. 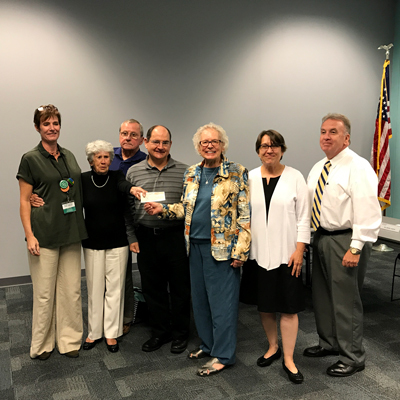 The Friends of the Levittown Library present a generous donation to BCFL in September 2017. The Friends support all kinds of initiatives, from capital projects to technological improvements to program sponsorship. By working closely with BCFL, Friends groups uniquely understand the library’s needs and priorities, and they work hard to raise the funds necessary to effect change. In the last year, Friends groups have contributed more than $45,000 to Bucks County Free Library. Most recently, The Friends of the Yardley-Makefield Library made a gift of $15,000 to support the 2018 Summer Quest program at the Yardley-Makefield Branch. Their primary fundraiser is their annual Book Sale, taking place this year on August 3-4 and 6-7 at the branch. The public is invited to browse hundreds of books of all genres, all in good condition and priced between $1 – $3. For more information about the Friends of Yardley-Makefield and their upcoming Book Sale, visit www.ymfriends.org. If you would like more information about our Friends, please contact Michelle Wexler, Development Director, at (215) 348-0332 x1115 or wexlerm@buckslib.org. To learn more about how you can support Bucks County Free Library, visit www.buckslib.org/support. Next Post: How Do You Like Our New Website?